Author and part-time comedian Bob Kulhan explains how improvisation techniques can boost performance. Knowledge@Wharton: You got into looking at this for what reason? Kulhan: I’m a Chicago-trained improviser, and spent just shy of 16 years in the trenches in Chicago studying the art of improvisation, literally from the people who created this art form before they passed away. I was teaching a lot of corporate improv programs, and at the time in the mid- to late 1990s it was vacuous, and it needed a way to connect to people. My formal degree is in business, and so the art of improvisation was a perfect match for me in showing people that this specific set of tools and techniques links directly to business through the behavioral psychologies and sciences, and [through] business schools. Improvisation is a communication-based art form that … is based in some core principles of business. It’s been used in business for 25-30 years. Knowledge@Wharton: Do people in a business setting often think in one way and don’t necessarily think on their feet? Kulhan: Absolutely. There are all sorts of biases that keep us from just communicating with people and keeping an open mind. What we look for in improvisation is a postponement in judgment and the critical thinking to another side so that we can take in and absorb the offers and opportunities that are being presented to us. [We could then] put ourselves in a better position to make smart decisions based on a number of variables rather than what we think is right or wrong, in the way that we look at things through our specific lens. Knowledge@Wharton: The concept behind the book is about a building process where you’re able to do certain things. But you want to also improve what you can do and your skills, and be able to move up the chain. Kulhan: Absolutely. 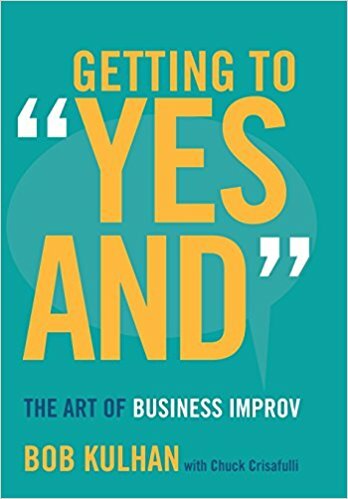 The “Yes And” [in the book’s title] is the cornerstone of all improvisation around the world, and so that’s what we’re trying to get people to understand. Our journey in getting to “yes and,” starts with personal development — what can you use for yourself? Then in interpersonal development — how can you help the one or two people around you? Then in team development — how can you help that larger group of people? Finally, how do you implement these improvisation tools and techniques inside a culture so that the culture itself and the people inside of it can be more adaptable, nimble and flexible, ready to take on change, and embrace creativity and innovation. At a leadership level, you work on things like influence, crafting culture, and helping foster talent. For example, [in the case of] millennials, it is about creating an environment in which ideas are shared openly, and there’s a greater sense of purpose than a paycheck or individual self-worth. Knowledge@Wharton: Team building is becoming a very important ability to have. As you said, it does benefit the company overall. Kulhan: Absolutely. When great minds and intelligent people are sharing thoughts with each other, the collective consciousness of the group will outweigh that of any individual. The team will be smarter than any one person who is operating in a bubble. Knowledge@Wharton: What is the general reaction you get from people involved in business school programs when you talk about improvisation? I would think there probably have been cases where you get a cross-eyed look about why improv is important. Kulhan: You’re hitting it on the head. About 17 or 18 years ago that cross-eyed look was also met with a scowl and very pursed lips. Improvisation has a connotation of comedy and comedy alone…. However, what’s happened over the last decade and a half is an evolution in the way that we perceive improvisation and the need to be better at it. It’s not only all these great business schools, [but also] great businesses that understand that adaptability, and comfort with change and ambiguity, volatility, uncertainty and complexity are core elements of how a company is built in this current day and era. Knowledge@Wharton: How important is the “and” part of the getting to “yes and”? Kulhan: It’s immensely important, because “yes” on its own is a definitive end. “And,” is the bridge to what you do with this information. “Yes” is unconditional acceptance, focus and openness to understanding what the idea is. “And” is a bridge to how you are focused, the bridge to your thoughts and your intelligence. “And” is the bridge to how you just react to the “yes” that you’ve just said. Knowledge@Wharton: You also write about how it takes away a little bit of a layer of fear that some people may have in a situation. Kulhan: Absolutely. If you look at just the core barriers to creativity or collaboration, communication, change, and improvisation on its own, fear is a major element of it. The act of executing “yes, and” on a regular basis eliminates that fear. [That includes] fear of judgment, fear of being judged, fear of repercussions of what you are going to say, fear of the unknown and fear of chaos. It removes much of that because the emphasis really is on communication and on collaboration, so it has that team element, and you’re not hanging one person out to try to judge that individual on his or her effort. You’re saying that this is a collective and an opportunity for all of us to get together, share ideas, and let the group intelligence come, and bring the best they can to any situation. Knowledge@Wharton: If there are mistakes made along the way, it doesn’t necessarily mean that a mistake is a be-all and end-all; it’s just a transition point. Kulhan: Absolutely. If you’re not making mistakes are you really pushing the envelope? Are you really innovating? There has to be a place in time in which risk-taking and mistake-making is not only accepted, but is encouraged. That’s in that let’s-make-a-mess divergent side, brainstorming and creativity process. You clean it up more in the innovation and convergent-thinking side where you’re driving all of this mess and cleaning it up to a productive outcome. We shouldn’t be judged at every single at bat at the plate. The batting average is taken by every single at bat over the course of an entire year. There will be some strikeouts, some foul balls, some hit by pitches, but ultimately it’s what you do over the course of that entire season that makes that batting average. That’s also where it should be in any business in relation to collaboration or creativity. It’s [about] what you do that represents your brand over a longer period. Knowledge@Wharton: You also bring up the term “thinking outside the box,” which has been a catchphrase in the business community. What’s your reaction to that phrase and how can it be linked to what you’re talking about in this book? Kulhan: It’s a good phrase on its own. The problem is, without knowing how to actually think outside of the box, it’s just a phrase, it’s just a set of buzzwords. It’s how you not only think outside of the box, but [also] just get the box out of the way. Creativity is subjective, and if all of us are just trying to say the smartest thing, the most creative thing, the opportunity for us to discover something truly innovative or a true disruptor is challenged because we’re all thinking inside the box while we’re trying to think outside the box. So just kick the box out of the way and let’s just communicate with each other on an equal-status level like we are trying to achieve something greater than what any one person can. Knowledge@Wharton: Having the ability to be able to improv at times can enhance the other skills that you have in the office place. Kulhan: Sure. The ability to improvise is based on several core elements, no matter what the context. If it’s improvisation on a comedy stage, or as elite chef, first responder, special forces team or radio host, it’s about being present and focused in the moment in real time, and then simply reacting to what’s being given to you, adapting to how the people around you are reacting to how you are reacting, and communicating across the board. Those concepts of being present, reacting, adapting and communicating can fit in so many arenas. Knowledge@Wharton: That enhances the person’s business resume, how their stature is viewed in a particular company, whether they are a true leader, whether they would move up the corporate chain, or whether they potentially will be picked by another company to come work for them. Kulhan: Absolutely. Presence alone, and the tenets that I just described, link directly to mindfulness which is a topic du jour for leadership, which of course then links to emotional intelligence. Using the tenets of improvisation on a regular basis help you achieve mindfulness and increase your emotional intelligence, which would help anybody’s resume. Knowledge@Wharton: What’s your view on mindfulness in general? Kulhan: Mindfulness overall is a great concept that almost everybody can use…. For most people to get to mindfulness, it’s based in meditation. Although that is an effective way to get to mindfulness I don’t think that’s the only way to do it. There’s more than one way to hit a piñata, and exercising the tenets of improvisation on a regular basis will help you get to that state of being present and focused and concentrating and aware, and at the same time not [being] blind to the situation around you. You have these soft eyes and you can observe and audit and take in with a high level of awareness the environment and people in the environment, and do the best you can at that time. Knowledge@Wharton: Is being able to use improvisation a skill that is transferrable to other people within your company? I would think that there are people who have the ability to see that quality and then use that in their own performance. But I would think there are probably other people for whom it would be hard to make that transition. Kulhan: There always will be hard nuts to crack, no matter what. That doesn’t mean we shouldn’t try. We lead by example, so our lip service does mean something to a lot of people, and the framing of our language should affect and support how we behave. Ultimately it’s our behavior that’s going to influence the people around us. When you align framing of language with your behavior, and you’re consistent, and explicit even in how you are doing this and why you are doing this, you can definitely influence people to behave in a certain way. This aligns with a mental framing, if you will, where instead of looking for reasons to shoot things down or reasons why things won’t work, you frame it into once again a “yes, and” philosophy, where you’re looking for opportunities and possibilities and potential as opposed to the negative aspect. When you look for the positive that doesn’t mean you dismiss the negative; it just means that if you have to operate within confines, budget, structure, deadlines, et cetera, you find ways to succeed within those confines, as opposed to using those confines for reasons why you didn’t succeed. Knowledge@Wharton: Is this something that you see growing more at the lower levels of companies and maybe into middle management, than at the C-suite? Kulhan: With my company, Business Improv, we specialize in C-level down. We’re working a lot in creating culture and environments in which people want to work. It’s about instilling intrinsic motivation in the people who are employed so that the turnover rate isn’t high, for example. With the current focus on millennials wherein there is a need to communicate between age differences and generations, there is a strong need to use improvisation techniques. It should be a top-down approach. If you want change to happen, everyone is going to watch the leadership to see what it is doing. So, if you have people who are change resistors or less apt to use this because of any reasons whatsoever, including a number of different biases, then that’s where the younger people and mid-level management will start focusing. If you allow people to put their time and energy and build into an environment, they’re going to be intrinsically motivated to buy in as well, to the culture of the company, the people, and the leadership. Knowledge@Wharton: It probably gives people the ability to feel like they can handle projects on their own at times. Kulhan: Absolutely. If you’re going to have a strong team, you have to have some trust blocks put into place. If trust and communication are cornerstones of your team, you can allow people to do their job and you don’t have to micromanage them or sit over their shoulders. They’ll come to you with challenges, questions and opportunities that perhaps you didn’t even see, and from there you can grow faster. From my experience corporate comedy is nothing to laugh at.